Sometimes it seems that voting is enormously complicated... some people will leave a polling booth with a desire to have a bit of a lie down in a quiet dark room. However... if you take the time to understand the voting process then you can easily maximise your vote. Most people (61%) do not like either major party. 39% give their first preference to one major party in order to prevent the other major party from getting in. And 29% of people actually believe the major party they choose is merely the "lesser of two evils"(1). But you can choose a third option (ie: vote for a minor party like the Greens or Democrats) and still have your vote count in the decision between Labor and Liberal if the minor party does not win. Q. When filling out a ballot paper, can I use crosses or ticks? A. You must use numbers only. On the lower house ballot paper you must number every square with a different consecutive number. A tick or cross will make your vote invalid. Q. Is voting for a minor party a waste of my vote? A. If you vote for a minor party (e.g. the Greens) your vote is never wasted. It must still count in the decision between between Labor and Liberal if the Greens candidate is eliminated. Preferential voting requires the elector to place a number next to each candidate in order of the voter's preference. It is the voter who controls the order of preference, not the party or the candidate. If a candidate receives more than 50% of the first preference vote, they win the seat. If no candidate receives a majority, the candidate with the lowest first preference vote is eliminated and his or her votes are redistributed to the remaining candidates according to the voter's second second preference. This process is repeated, using third perferences and fourth preferences) until one candidate receives more than 50% of the vote. So your vote can be counted several times as it is redistributed to the remaining candidates. As an example, if you vote Greens , One Nation , then ALP , and Liberal  your vote will go first to the Greens. If One Nation has the lowest number of primary votes, their candidate will be eliminated first. All One Nation votes will then be distributed in accordance with the voters' preferences. So the One Nation votes will be allocated to all of the other parties depending on the numbers that a voter has placed on each individual ballot paper. If the Greens vote is the lowest after the distribution of One Nation preferences they will be the next to be eliminated. When the Greens are eliminated, all of the Greens votes (including any One Nation votes that had been distributed to the Greens) will be re-distributed to the next prefered party that remains in the count. So any One Nation votes that had been distributed to the Greens pile will now be re-distributed to the 3rd preference stated on those ballot papers. ALP is the next choice on your ballot paper because your second choice (One Nation) has already been eliminated, so your vote will now go to the ALP. This movement of votes, in the order of the preferences the voters have chosen, will continue until one candidate wins with more than 50% of the vote. It is impossible for your vote to be eliminated from the count prior to the winner being determined. All ballot papers must be counted either for or against the winning candiate so it is simply impossible for any votes to be wasted. More than half the population of Australia do not know how preferences work. They are simply voting out of ignorance (or confusion). So do not be worried about voting for a minor party or an independant. Your ballot paper will still be counted even if it comes down to a choice between the two major parties. Q. I want to vote Greens but the How to Vote card shows they are directing second preferences to a candidate who I don't like. What should I do? A. You should Vote 1 for the party of your choice, ignore the how-to-vote (HTV) card and rank the rest of the candidates according to your personal preference. • Open Ticket: This type of card suggests you should vote Greens first, then number every candidate according to your own choice. They do not recommend preferences to anyone. Here is an example. • Split Ticket: On one side of a split ticket how to vote card, it will tell you how to vote Greens while giving your preference to Labor ahead of the Liberals. On the other side of the card it will tell you how to vote Greens while preferring the Liberals ahead of Labor. Depending on which major party you prefer, you could follow either suggestion. • Directing Preferences: This is the most common type of HTV card. It might suggest to vote Greens first, then follow a precise order of preferences which the party recommends. This type of card usually directs preferences to parties who have policies which are more compatible with Greens policies. You will notice the Greens How to Vote card states the party affiliation of all the candidates. If you follow a Greens HTV card, you can see who you are giving your second and third preference to. The Labor and Liberal HTV cards don't include that information. The major parties do not want you to know or think about who you are actually voting for or who your preferences are going to. You should NOT follow a HTV if it hides all the party affiliation information from you. We think you should be aware who you are giving your second preference to. The major parties often make an issue of who the minor parties direct preferences to, but they don't want you to know who they are asking you to preference. If you don't like or trust How to Vote cards, there is a better way of voting which does not require you to follow ANY HTV card! You can simply vote 1 for the candidate of your choice, and keep filling out numbers in the order of your preference until all boxes are filled. This way you can ignore all of the How to Vote cards! Provided you number every square and do not repeat any number, your vote is valid and must be counted. Remember, the How to Vote cards are SUGGESTIONS only. These HTV cards are a guide for people who have little idea about how our electoral system works or who the various candidates are, which unfortunately is a majority of people. Although how to vote cards may make it easier for people to vote, they do nothing to educate people about how voting really works. Remember, you do not need to follow How to Vote cards. It usually makes no difference to your favourite party whether you follow their how to vote card or not - so do not feel pressured to follow a Greens how to vote card just because you like the Greens. In some States (Tasmania, ATC) HTV cards are illegal at local or State elections. We think HTV cards should be illegal at all State and Federal elections. It constantly amazes us how often people will get annoyed at the "how to vote" card. They become outraged that preferences are directed to the major party they do not like and they exclaim with indignation that they cannot vote Green (for example) because preferences will flow to Labor (for example) if the follow the card. Yet the voter is the person who physically writes the numbers in the boxes!! All they need to do is vote 1 Greens and then preference each other candidate in the order they like. They are free to mark Greens first and ALP last, for example. If you don't like what is suggested on a HTV card, please just IGNORE it and use your own preferences! Much of this confusion probably arises because of the media's fixation with wanting to know which major party the minor parties will "give their preferences to". This falsely implies that the parties control how your lower house preferences are distributed. Q. If the Democrats are preferencing the Greens, why shouldn't I just vote Greens in the first place, 'cos that's where the Democrats how to vote card says they are sending their preferences? A. In the lower house, no party can send your vote to any other party. When you fill out the ballot paper in the order of your choice, you are stating where your preferences flow. If the candidate who gets your first vote is eliminated, then that candidate is out of the race and s/he has absolutely NO say as to where your vote will go. None. Zero! Your vote can go only where your preference states. So although a candidate may be "directing preferences to the Greens" what this really means is that the candidate is asking her supporters to put the Greens second. But bear in mind that your vote will never reach the Greens if they get eliminated before the Democrats (or whoever you give your first preference to). In the lower house, it is very likely that the Greens candidate will be one of the last three standing (together with the ALP and Coalition candidate). If you voted Greens, all the other minor candidates are very likely to be eliminated before your second preference is considered. So in most cases all that is relevant is what order or ranking you place the major parties. If you vote Greens 1st, ALP 2nd, Liberal 3rd it will often have exactly the same effect as if you had placed 4 minor parties or independants in the top four spots and then voted Greens 5th, ALP 6th, Liberal 7th. Some people think that when you vote Democrats, then the Democrats somehow have control of where your vote goes, and their prefence directions somehow affect your vote! No party or candidate has any ability to control where a lower house vote or preference goes!. A. Each State elects 6 senators at a half senate election, so your vote counts to elect more than one person. Each State has 12 senators who have a term of 6 years each. Half of those seats are up for election at a normal Federal Election, called a half-senate election. The ACT and NT each have 2 senate seats. Both those seats are up for election at a half-senate election. At a double dissolution election, all seats in the Senate are vacated and up for election. 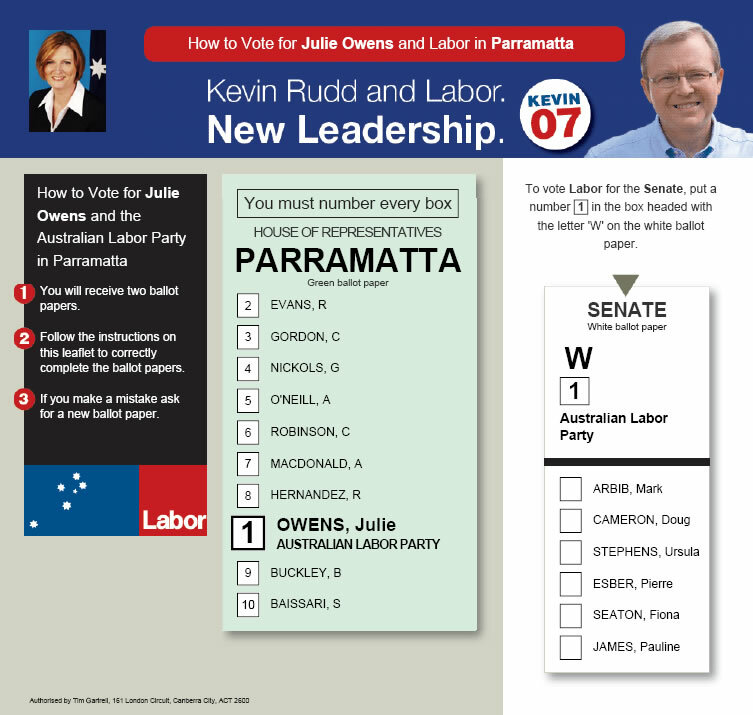 On Victoria's Senate ballot paper the ALP will have 6 candidates - one for each seat available. A candidate will win a seat if he wins 14.29% of the vote - this is called a quota. If the lead candidate gets 36.0% of the entire senate first preference vote, then he or she will be elected. This will remove 14.29% of the votes from the ballot. The remaining 21.71% of that candidate's first preference vote is distributed according to the second preference chosen by each voter. The vast bulk will probably flow to the second ALP candidate. Let's say the second ALP candidate on the ballot holds 3% first preference votes and then picked up 21% of the vote from the distribution after the lead candidate was eliminated. The second candidate now has 24% of the vote, which is more than a quota, so they are elected too. The remaining 9.71% of that candidate's vote will now be distributed, and even if all of it goes to the third ALP candidate, they will be under a quota and will not be elected. In all States you can expect the first four senate seats to be taken by the ALP and Coalition candidates who will gain a quota without relying on minor party preferences. Once there are no more candidates with a quota, the candidates with the lowest vote get eliminated and their votes are distributed. Eventually further candidates will pick up preferences and eventually another 2 candidates will get quota and be elected to the last two Senate seats. Q. In the Upper House, should I vote above the line or below the line? A. You should not vote above the line unless you are aware that the party you vote for has full control over your preferences and may be using your vote as part of a preference deal that is in the party's interests, but might not be in your interests. In the upper house (the ballot paper that is quite large because there are dozens of candidates) there is that ominous "line" above or below which you must vote. Here there are two alternative ways of voting. You can vote for a single party by voting above the line, or you can vote for each candidate individually by voting below the line. If you vote above the line, you mark a SINGLE box only against the party of your choice. What then happens is that your ballot paper will be deemed to have adopted the order of preferences that have been pre-determined and pre-registered by that party. There should be a chart in the polling booth showing you what those preferences are. If you don't like the order of preferences which have been pre-registered by the parties, or don't want to risk your vote going somewhere you don't want, you should vote below the line and decide your own order of preferences. If you vote below the line then you can control exactly where your preferences go in the same way as in the lower house. But remember you must fill out all the boxes if you vote below the line else your vote will not be valid. The slightest mistake on the form can render your vote invalid. One way of ensuring your vote is not invalid is to also vote above the line for the party of your choice. That way, if you have made a mistake in the below the line vote, then your above the line vote will be counted instead. Again, if the candidate of your first choice is eliminated, your vote is not eliminated but it is transferred to the candidate who you have given your next preference to. Q. I am going to vote Democrats, but I'm not sure if it matters if I put a major party or the Greens second on my ballot paper. A. You should always place the party you prefer ahead of those you prefer less, regardless of the size of the party. Most minor parties will recommend that you to give second and third preferences to independants and minor parties - like the Democrats, Greens or Socialist Alliance. This is because the minor parties have more in common with the policies of small parties, and they often oppose the policies and practices of both the major parties. Even though the small candidates will very likely be eliminated before the Democrats (and so preferences can never be distributed to them), it is still an indication of support to have them ranked high on the how to vote card. The majority of preference rankings have a purely symbolic value and don't have any effective role in deciding the election. As the major parties will usually be the last ones standing, your vote and preferences have more meaning if you rank your favourite smaller parties ahead of your favourite major parties. And always rank the parties you detest - large and small - last! If you voted Democrats, and the Democrats candidate gets eliminated, you can safely assume that all smaller candidates have already been eliminated. So if a minor candidate like Socialist Alliance is your second preference, there is a very low chance that your vote will actually flow to them because they will probably be eliminated before the Democrat candidate. So putting the Socialist Alliance second is of little consequence - meaning there is little risk they will ever get your vote. So your second preference will be skipped, and the vote will flow to your third preference. If you put Liberals second, the vote will probably stay with the Liberals as they are unlikely to be eliminated. The last two parties can never be eliminated. Once your vote gets allocated to the ALP or Coalition, who are unlikely to be eliminated , it will usually not be transferred any further. Unless you love one of the major parties, this is probably undesirable. So the best tactic is to place smaller parties ahead of larger parties if you do not want your vote to get trapped with a major party. If you can not decide between which of two parties to vote for, then always put the smaller party in front of the larger party. With some care and luck, it is possible for your vote to be passed onto all but one candidate on the ballot paper! If you put Liberal second last on the ballot and ALP last, and in most seats Liberal will still end up with your vote. Some people exit a polling booth and say proudly - "I like the Greens so I put them second". Little do they know it is totally useless putting the Greens second if you put a major party first. Q. I live in a safe Labor seat, so what is the point of voting for a minor party if they are going to lose anyway? A. Your primary vote is still very valuable because it indicates the level of support and it triggers election funding. The number of primary votes a party gets is an important indicator of the popularity of that party and its policies. It is also important to understand that the party to whom you give your first preference in each house of parliament will, if that party wins more than 4% of the primary vote, receive electoral funding of about $2.31 per vote. This was introduced to reduce the reliance of the parties on corporate donations so as to make a less biased parliament. Unfortunately, the effect of this legislation has not reduced corporate donations at all. Political diversity is important - just like bio-diversity - and minor parties are a very important part of the political landscape. Minor parties, especially those that refuse to accept donations from gambling, tobacco and property development companies etc, probably deserve your $2.31 more than the major parties, who together collect more than $25 million each year from corporate donors. Compare this with the Greens who refuse most corporate donations and survive almost entirely on the electoral funding that is raised from people giving the Greens their primary vote. When allocating your first preference, you should give some consideration to which party you think deserves $2.31, knowing full well that if your candidate gets eliminated then your vote (but not the funding) will flow to your second or third preference. If you vote for a candidate who wins less than 4% of the vote, there will be no funding allocated to that candidate. Q. I intend to vote for a major party (i.e. Liberal or ALP) in the lower house. Will it matter what party I preference second? A. If you are voting for a major party in the lower house, your second preference is probably irrelevant unless you are in a seat where a minor party or independant has a chance of winning (e.g. seats like Melbourne, Sydney, New England, Kennedy). Your second preference can never be considered unless your primary candidate has been eliminated from the ballot. In most seats the major parties are not eliminated - so your preferences will never be allocated if you vote for a major party. In a large number of seats a major party candidate will win the seat on primary vote alone, without any preferences being distributed. In those seats it is irrelevant who you preference second no matter what party you vote for. (1) Research conducted by McNair Ingenuity Feb 2004. This article borrows some material originally published by Andrew Wilkie. how to vote labor. how to vote alp. how to v ote liberal. how to vote national. how to vote greens. how to vote democrat.